"CG" (Common Ground) and "CP" (Common Power) Polarity. When purchasing a replacement it is important you determine the Polarity of your device and match the glasses polarity accordingly. "PHOTOSONIX glasses are not tested with other maker devices, we advise you ask the maker of your device prior to purchasing a replacement made by PHOTOSONIX"
In the event the maker is not longer in business, we are afraid you will need to try one of each polarity". If the connector or receptor of the glasses input/plug on your old glasses or device is not that of a 3.5mm stereo jack, no need to try any PHOTOSONIX made glasses. PHTOSONIX ColrTrack and ColorTrack4 glasses will not work on devices not made by PHOTOSONIX. 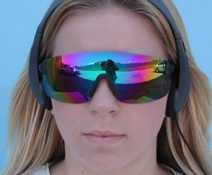 Other maker devices simply do not have enough power to run the electronics in the PHOTOSONIX ColorTrack and ColorTrack4 glasses.